On November 30, 1942, 2nd Lt. Daniel B. Austin of Dorchester, Massachusetts, took off from Westover Air Field in Chicopee, Mass., for a routine training flight. 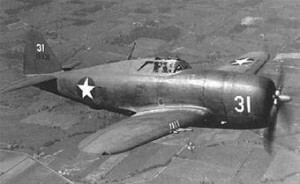 He was piloting a P-47B Thunderbolt, (Ser. No. 41-6024). At 3:30 p.m. he was killed when his aircraft crashed into Higgins Swamp, a marshy area to the east of Barnes Airport in Westfield. Although numerous persons witnessed the accident, the cause was not immediately known. Lt. Austin was assigned to the 321st Fighter Squadron. The Springfield Republican, (Springfield, Mass. ), “Army Flier Dies In Westfield Crash”, December 1, 1942.